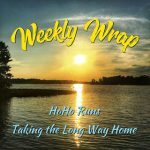 Two weeks to go until my double marathon! Yikes! 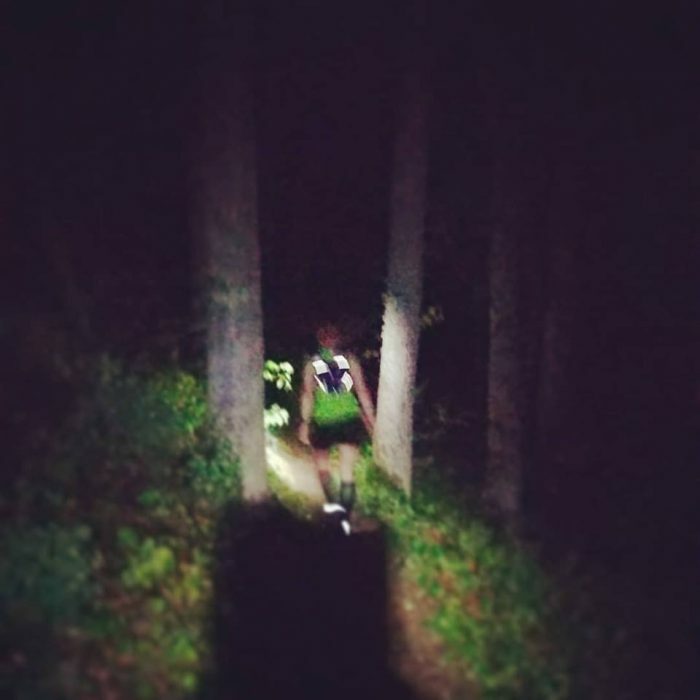 My schedule called for a 24 mile final long run this past weekend, and as luck would have it, the trail running group I’m a part of decided to hold a nighttime run on Friday. Now, I am a very slow runner. The rest of the group planned to start at 8 PM and do two loops (a loop is 11 miles plus a two mile warm-up loop). DH and I decided to camp and were able to reserve a spot right next to the trail. Doing the math, we realized that we might be out there until 3 AM if I waited to start until 8 PM. So I started at 5:30 PM. After my first loop I met the rest of the group just taking off. I also got a glimpse of the epic aid station. As part of the run we were all supposed to bring something. And bring it we did! All sorts of chips, soda, candy, subs, bread, hummus, crackers, and more. It was also raining quite hard, and I half hoped that DH wouldn’t want to run the second loop with me so I wouldn’t have to go back out there. But go back out there we did, with me leading the way and DH practicing pacing me. I started out strong but after two miles started to doubt my footing. The slippery rocks and tree roots had me nervous. The headlamp only showed so far. One time I looked down to see a frog staring back at me and I screamed, haha. Then I was seeing them all over the place and worried about stepping on them. While we were trudging through the rain, I was reminded that the rainy season has begun for the Rohingya refugees (those to whom I have dedicated my double marathon). I imagined myself walking in conditions worse than this for several days. Suddenly it didn’t seem so bad. Surprisingly I was not tired, probably helped by the fact that I had had a crazy travel schedule earlier in the week and was off my regular routine anyway. At the end of the run I had a lot of gas left in my tank and the other group caught up to us right at the finish. I was soaked, muddy, but it was a total blast! And good practice, because I think it will take me at least 15 hours to complete the double marathon. It starts at 6 AM so that means I’ll finish around 9 PM at the earliest. We celebrated our run with the aid station feast and then went to bed. 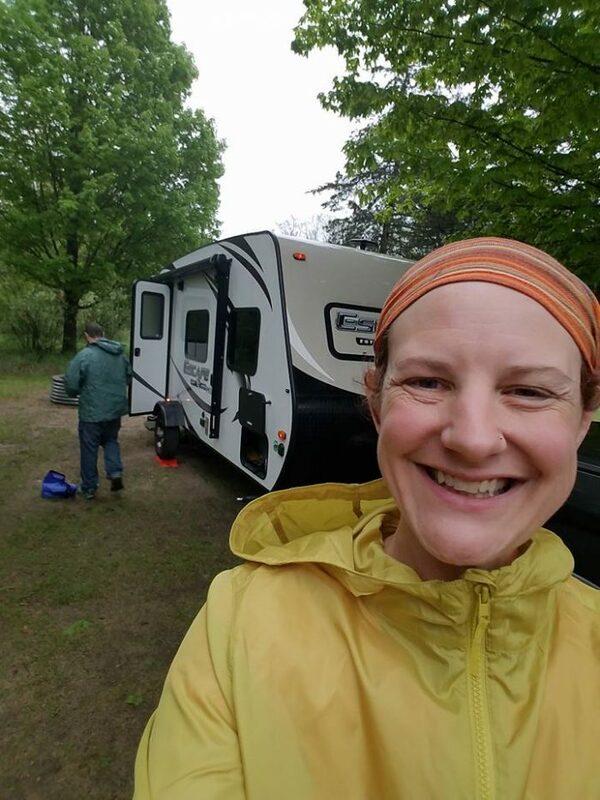 I was so glad we had decided to camp rather than drive the hour or so home. It was a great night in our camper–the first for the season. Incidentally, it was STILL raining the next day! The next two weeks are taper, which is kind of nerve wracking. Have I trained enough? Am I mentally and physically tough enough to get through 52.4 miles? We’ll find out! I’ve been blown away by your generosity. I’ve already met my original goal to raise money to provide community kitchens and health, nutrition, water, sanitation, and hygiene sessions for Rohingya women and children! Let’s see if we can double my original goal! (just like the marathon, haha). I truly appreciate any support you can provide. It will benefit an amazing cause! I’m so happy that you felt so great after this run!! I’m also happy that I get to live vicariously through you. I just don’t think I could do a night run, much less a double marathon. You are amazing! You should try a night run, it is so fun and exhilerating! Wow. Just wow. You are incredible!! I don’t know that I could do a night run – I’d be terrified! I’m already a little afraid of the dark. lol And, girl, I feel you on those frogs. I went on a trail run super early one morning and it was wet and frogs were everywhere! I was so afraid I was going to step on one – or 12!!! Blah!! And a double marathon?! Wow. Seriously. WOW. Smart to bring your camper. I would have done the same thing! Kudos to feeling awesome after a long run – that’s always a great feeling! A marathon in one day is tough enough and cannot imagine a double marathon. Wow! Oh my goodness, frogs! I would be afraid of stepping on them too. Sounds like quite the challenging trail for sure! I think this was a great idea for a training run, especially with the “aid station”. Although not the best conditions, at least you were able to practice the very ones you may face on race day. You will cross that finish line, no doubt. Enjoy your taper weeks. Congrats on the great run, Wendy! Your picture shows how satisfied and happy you must have felt after that long race.